We recommend that all Greensboro area residents undergo regular screenings for sexually transmitted diseases. Getting checked does not have to involve an embarrassing visit to your doctor, long wait times, or crowded waiting room. Instead, we give you the option to place your order from the comfort of your own home and decide when and where you get checked. STD testing Greensboro only takes 15 minutes and no appointment is required, so it's easy to work around your schedule. With among the lowest std lab test prices, you can get what you need at a price you'll love. Why choose us for STD testing in Greensboro ? We are proud to offer a variety of STD testing Greensboro locations in the 33185 area. We allow you to select the location closest to you and visit at your convenience. 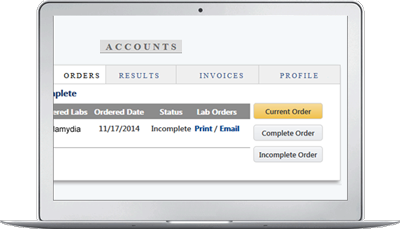 You can even get your screening on the same day that you place your order. Your STD testing Greensboro lab visit will only take 15 minutes, so you'll be in and out quickly. Not only are our services speedy and accessible, but we also offer among the lowest std lab test prices on all of our services. We have made getting tested quick, affordable, and convenient. Don't put it off any longer. Let us help you protect your health, privacy, and well-being. The STD testing Greensboro laboratories that we partner with are considered the top STD testing centers in the country. They are staffed by a team of knowledgeable medical professionals who provide excellent care to our patients. Your STD testing Greensboro lab visit will only take 15 minutes and you don't need an appointment. Because our labs provide a variety of diagnostic services, no one will know that you are there for to get checked for sexually transmitted diseases. This helps ensure your privacy at the STD testing Greensboro laboratory. Our staff strictly adheres to all privacy regulations, including HIPAA. The privacy of our patients is a priority. Our STD testing Greensboro lab locations use the most advanced screening methods available on the market and they are the same ones often used by hospitals. This means that you can trust the accuracy of the STD testing results that you receive.